Spring for a Gift Card! Good Works Auto Repair has the perfect way to say “Happy Mother’s Day”, “Thank You”, “Happy Holidays”, or even “I care about your safety!” to that driver on your shopping list. Our gift cards can be used on any service and for the gift that keeps on giving, this is a refillable gift card and comes with a personalized login to check the balance and more. 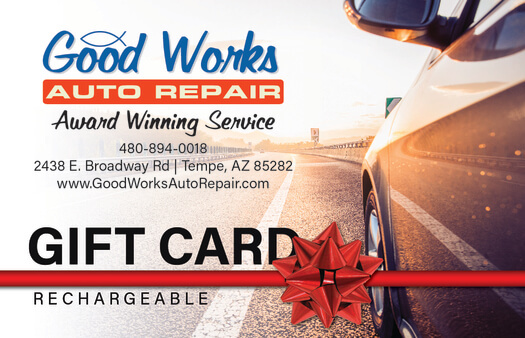 Call 480-894-0018 or stop in today to simplify your gift giving! Fine Print: Sorry, we cannot reissue lost or stolen cards. 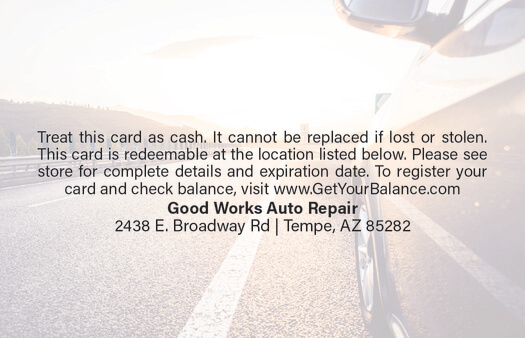 All residual value left on your card will be rolled over to your next visit, we cannot give cash back.